University has constituted a committee on admission of NRI students in JNTUH.This committee, after detailed discussion, has formulated the guidelines and procedure based on AICTE norms, rules followed by other universities in Andhra Pradesh and other states .The committee recommended to implement in its constituent Units/Colleges/Institutions/Schools from the academic year 2012-13. • The NRI Quota should not exceed 5% of the total sanctioned intake in each branch of UG, PG and Ph.D Degrees as supernumerary seats. • Admission to NRI seats may be made on the basis of the marks in the qualifying examination as per order of merit. • The candidates who are seeking admission under NRI Quota are exempted from appearing for the EAMCET. • The Candidates are required to have obtained a First class in the Higher Secondary Examination (10+2) pattern or its equivalent. • NRI financially supporting the candidate must be blood relation such as Father/Mother/Brother/Sister/Uncle/Aunte/Legal guardian. 􀂙 Indian citizens who stay abroad at least for a period of one year for study or research or employment or for carrying on a business. 􀂙 Indian citizens working abroad on assignment with Foreign Government agencies. 􀂙 Officials of Central and State Government and public sector undertaking deputed abroad or posted to their offices, including Indian diplomat missions, abroad. • The Admission will be made through DUFR and with the approval of “NRI admission committee” consists Rector, DAP, DE, DA, DAA, D/UFR (Convener), Principal / Director of respective Academic Units. • Candidate must furnish the Xerox copies of the following documents of the supporter. 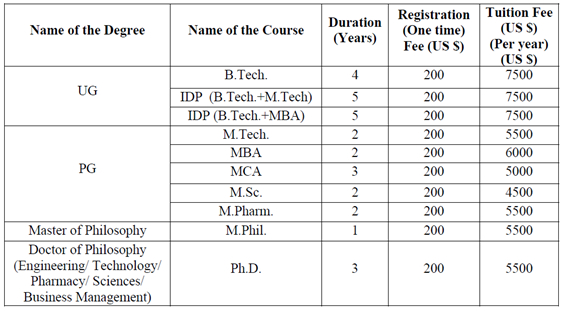 􀂙 Tuition Fee and Registration Fee be paid to “The Registrar, UFR Account, JNTUH” in the form of Challan. (iv)In addition to the Fee prescribed above all Students should pay additional fee of USD 1000 $ towards the Development fee, caution deposit, Library, Laboratory, syllabus books, Identity Card etc. This fee is to be paid only once at the time of admission as prescribed by the respective constituent academic units of the university. This should be paid to “The Director, UFR Account, JNTUH” in the form of Challan.